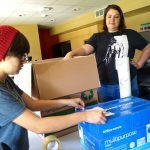 NMSU students collected thousands of ink cartridges for recycling last fall. The Office of Sustainability organized the recycling drive to improve and maintain the quality of human life while preserving the integrity and beauty of ecological systems for the future. 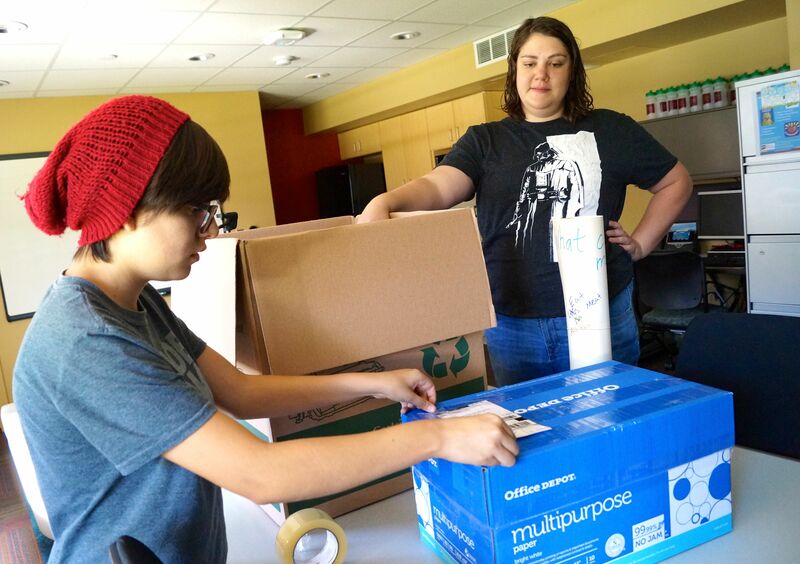 “The student organization, AgGAYS, volunteered to put in a box all the used toner cartridges to ship back to vendor Staples instead of throwing them away,” said Joni Newcomer, manager of environmental policy and sustainability at NMSU. “Go Aggies! Go Green!” Logo of the Office of Sustainability at NMSU. Hundreds of millions of used ink cartridges are tossed out every year. According to the NEMS National Environmental Management System, approximately 1.3 billion toner cartridges are used around the world annually and less than 30 percent are currently being recycled. “A number of companies collect empty toner cartridges from schools. These cartridges are then usually refilled, so they can be used once again. This keeps cartridges out of landfills. Utilizing existing materials helps to conserve the elements of the earth and resources,” Newcomer said. The Office of Sustainability at NMSU opened in 2010 with the purpose of making students more aware of their community and the environment. As part of this effort, Newcomer helped to develop 10 sustainability initiatives to motivate both students and faculty to take care of the campus. “I put the waste reduction initiative into practice this month hosting a cartridges recycling drive. The volunteers and I emphasized the importance of the ‘three Rs’ of reduce, reuse and recycle,” Newcomer said. According to U.S Supplies Recycling research by Info Trends, in 2010, Staples collected nearly 55 million ink and toner cartridges in the U.S in its recycle program. Newcomer said recycling toner and ink cartridges have several environmental benefits, including decreasing greenhouse gas emissions and saving energy. Volunteering for this event provided NMSU students an opportunity to do something positive for their community. “The real tragedy behind the mountains of trash we produce is that a lot of what we throw away can be reused or recycled. This is the case of the toner cartridges,” said Nadia Montoya, a psychology major student and volunteer at the Office of Sustainability. “Not everything is recyclable, and some materials are more easily recycled than others. But recycling makes perfect sense in any case,”Montoya said. NMSU has been recycling printer cartridges for more than four years. “People simply do not realize it can take years for an empty printer cartridge to biodegrade in a land-fill site. We used to think that after we discarded something into a landfill that it would biodegrade soon, but it does not really happen,” Montoya said. According to the Office of Sustainability, it takes up to 456 years for the cartridges to decompose. “Recycling toner cartridges is good for our pocket as well as the environment. To refill an old cartridge, we can save more money over the cost of buying a brand new cartridge at retail price,”Newcomer said. AgGays sent the box containing the cartridges to Staples where the pieces are evaluated for recycling or reuse. “I encourage students to go green. It brings important long-term benefits because it conserves natural resources, saves energy and reduces pollution. It is great to have a sustainable campus,” Montoya said. Montoya said each student can be part of a group that does something significant for our community. “I have been recruiting students since the beginning of the semester to be part of this activity. Still, I would like more volunteers to be involved inside and outside NMSU,” Montoya said. The NMSU Sustainability Council has meetings every first Tuesday of the month from 8:30 a.m. to 9:30 a.m. at Milton Hall Rm 85. It supports best environmental practices for students, faculty and the local community.